Steve Sando, the owner of Napa Valley’s Rancho Gordo, wrote the book Heirloom Beans (© 2008, Chronicle Books) and shares these tips for preparing beans. On bean-cooking day at Rancho Gordo, Sando rinses the beans in lots of cool water and checks them for small pebbles and other debris. Then he covers them with about an inch of cold water and lets them soak for two to six hours; though optional, soaking beans improves their texture and helps them cook evenly. 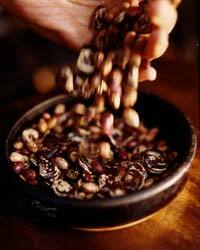 These pinto-like beans, first grown by the Anasazi, are ideal in Southwest-American and Mexican dishes. Though native to Colombia, these are the classic choice for the Italian soup pasta e fagioli. 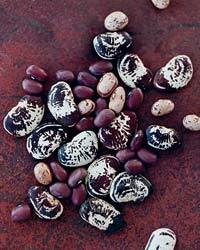 The stunning magenta-and-white-flecked Peruvian beans make a terrific, chestnutty side dish. This firm, starchy bean, named for the Hutterite religious sect, is excellent in stews. Fantastic in salads; gardeners also love them for their bright red flowers.